Let your child cuddle with our super cosy and fabulous 9 tog kid's duvet and pillow sets. Our exclusive 9 tog duvet and pillow sets with 50% polyester and 50% cotton casing will bestow your child with heavenly warmth and comfort. Its lavish hollow fibre filling are extremely soft and breathable to keep your child cosy and dry throughout night. Besides being super comfortable, our luxurious 9 tog kid's duvet and pillow sets are highly durable and machine washable. Available in cot bed size, our kid's duvet and pillow sets are finest of all that your child will surely love. Embellish your child's bedroom with our deluxe kid's duvet and pillow sets. Filled with breathable hollow fibre, our luxurious kid's duvet and pillow sets are perfect for pampering your kid with immense cosines. Kid's duvet in tog rating 4.5 and 9 will surely bestow snugly experience to your dear kid. 50% Polyester and 50% Cotton casing is silky and smooth and ensures that it does not scrape your kid's cheek. 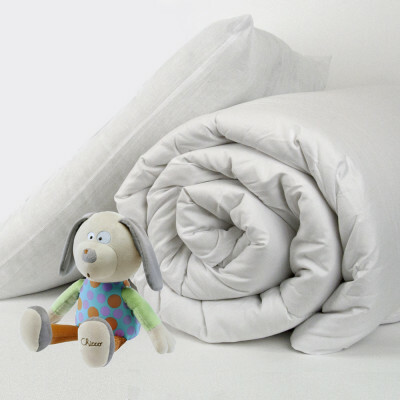 Made from finest material, our kid's duvet and pillow sets are highly durable and machine washable too. Bedding mill offer cot sized kid's duvet and pillow sets that perfectly hugs your kid's cot sized bed.